Two people have been killed in a collision between a train and a van on a level crossing in Lincolnshire. Police say a single carriage passenger train hit the van on an unmanned crossing at Helpringham Fen near Sleaford, at about 1.30pm on Monday. Both victims were occupants of the van. Three passengers on the train, a guard and the train driver have been taken to hospital suffering from shock. They are being treated at the Pilgrim Hospital in Boston. The single-carriage Central Trains 153 diesel, which had left Peterborough at 12.41pm, collided with the van on what is known as a user-worked crossing. 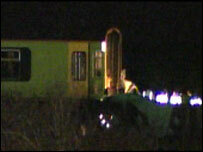 A spokesperson for Network Rail said: "The train hit the vehicle on a farm crossing on a private road. "The driver of the train was not hurt and none of the passengers was injured. The train was not derailed. British Transport Police are investigating." The accident just a few miles from the scene of a similar collision last month when a train with about 50 schoolchildren on board ploughed through the crossing gates at Rowston. Acting general secretary of Aslef, Keith Norman said: "This latest incident adds urgency to our call for additional active safety measures at level crossings to ensure that either automatic or driver operated braking is triggered if obstacles remain on the line. "These measures are needed not only on high speed lines where there is the potential for great loss of life and damage, but also on slower lines." Network Rail said there are 3,967 user-worked crossings. A spokeswoman said: "These crossings are typically in use on private land in rural areas and do not have automatic gates. "They are equipped with a phone so road users can call a signal worker to see if a train is coming, or, as in this case, there is no phone as anyone crossing the tracks has a good view up and down the line and can clearly see if a train is coming." There were 24 incidents of collisions between vehicles and trains at level crossings in the UK in 2003. The previous year there had been 16, and there were 17 in 2001 and 17 in 2000.